Good hospice care at the end of life can be a godsend to patients and their families, all agree, whether the care comes at home, or at an inpatient facility like this AIDS hospice. Still, oversight of the industry is important, federal investigators say. We all hope for a little peace at the end of life, for ourselves and for our loved ones. Hospice services can play a big role, relieving pain and providing spiritual and emotional support. But a federal report published Tuesday synthesized patient and Medicare payment data going back to 2005 and found that, while patients generally can count on hospice to relieve their suffering, some hospice providers are bilking Medicare and neglecting patients. The report calls for the Centers for Medicare and Medicaid Services, which is a key player in the funding of hospice services, to increase its level of scrutiny to improve the detection of these problems. 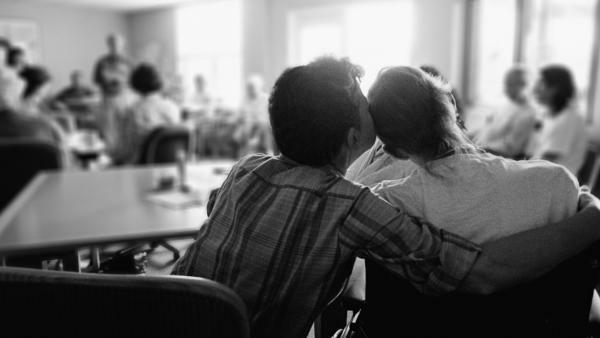 Hospice services are an increasingly popular Medicare benefit. In 2016, Medicare paid hospice providers $16.7 billion. A decade earlier, it was $9.2 billion. And, unlike many other health care providers, hospices aren't paid per service rendered. They're paid per patient, per day, "regardless of the number of services they provide and regardless of the quality of care they provide," says Nancy Harrison, a deputy regional inspector general in the U.S. Department of Health and Human Services and the lead author of the report. While patients can generally count on hospice to relieve their suffering, the report shows that sometimes patient needs have been ignored. "We found that hospices provide fewer services on the weekends than during the week," Harrison says. "Far fewer, actually. And patients would have pain on weekends just as well as they have it on weekdays." There were other forms of neglect noted in the report. For example, one hospice billed Medicare for more than two weeks of high-level care without ever visiting the patient. They'd just call his family and ask how he was doing. The federal reviewers also discovered that some hospice providers would seek out patients who live in nursing homes or assisted living. Those settings allowed them to bill Medicare for a level of service that some patients didn't need, but that cost the government almost 4 times as much as basic, in-home care. As a result, in 2012 alone, Medicare paid $268 million for expensive, inpatient hospice care for patients who didn't need it. The report also highlights how some hospice companies make money by outright fraud. Derrick Jackson, a longtime HHS investigator, recalls a 2014 case where a Mississippi hospice owner signed up clients who were not terminally ill and therefore didn't qualify for hospice. The owner was sentenced to nearly six years in prison and had to pay back almost $8 million. Jackson says the patients in this case didn't even know they had enrolled in hospice. "Often these hospice owners will market themselves as 'we will clean your house for free' — in other words, a housecleaning service. Other times, he says, the new clients were elderly, isolated people who just wanted "someone to come over and sit down and talk with them." The consequences of enrolling in hospice when you don't need it are serious, says Harrison. "When a patient does elect hospice care, they are waiving their right for Medicare payment for curative treatment," she says. "So, in effect, they're giving up curative care. And if they don't know they're doing that, they could be making not the best choice for their future." CMS didn't provide anyone for an interview for this story. The office did release a written statement that says: "Ensuring patient safety and access to quality care at hospice and all certified care facilities is paramount to CMS' work. The agency takes the oversight role of the Medicare hospice program seriously and is aggressively focused on reducing and eliminating fraud, waste and abuse." However, in a letter to Daniel Levinson, the inspector general at HHS, CMS Administrator Seema Verma, rejected more than half of the report's recommendations. Harrison, lead author of the critical report, believes it crucial that the government get this right "because hospice is eventually going to touch us all." Hospice services can offer some peace at the end of life, helping to relieve pain and providing emotional support. But a new government report highlights the ways in which some hospices cheat Medicare and neglect patients. NPR's Ina Jaffe has the story. INA JAFFE, BYLINE: In 2016, Medicare paid hospice providers $16.7 billion. And hospices are not paid for each individual service. They're paid by the day. NANCY HARRISON: Regardless of the number of services they provide and regardless of the quality of care they provide. JAFFE: That's Nancy Harrison. She's a deputy regional inspector general in the Department of Health and Human Services and the lead author of the new report. While patients can generally count on hospice to relieve their suffering, the report shows sometimes patient needs have been ignored. HARRISON: We found that hospices provide fewer services on the weekends than during the week - far fewer, actually. And patients would have pain on weekends just as well as they have it on weekdays. HARRISON: That cost Medicare $268 million. JAFFE: Then there are hospice companies that make money by outright fraud. Department of Health and Human Services special agent Derrick Jackson recalls a case where a Mississippi hospice owner signed up clients who were not terminally ill and didn't qualify for hospice. The owner was sentenced to nearly six years in prison and had to pay back almost $8 million. Jackson says the patients in this case didn't even know they'd enrolled in hospice. DERRICK JACKSON: Oftentimes, these hospice owners will market themselves as, we will clean your house for free. A lot of times, people just want company. Right? You have elderly folks that no one comes to see them, and they want somebody to come over and sit down and talk with them. JAFFE: The inspector general's report has 15 recommendations for improving the system. Basically, they say CMS, the Centers for Medicare and Medicaid Services, should analyze more data to ferret out scams and share that information with inspectors and the public. CMS declined NPR's request for an interview. But in a letter to the inspector general, the agency's head, Seema Verma, rejected more than half of the recommendations. CMS also released a statement saying, in part, that the agency is aggressively focused on reducing and eliminating fraud, waste and abuse. Nancy Harrison, the report's lead author, says that it's crucial for the government to get this right. HARRISON: Because hospice is eventually going to touch us all. JAFFE: And when that time comes, no one wants it to be harder than necessary. (SOUNDBITE OF SLOW DANCING SOCIETY'S "A SONG THAT WILL HELP YOU REMEMBER TO FORGET") Transcript provided by NPR, Copyright NPR.